Edvald Boasson Hagen took his and Team Sky’s second stage win of this year’s Tour de France in Pinerolo this afternoon, but race leader Thomas Voeckler conceded more time in the overall standings. Boasson Hagen was in the main break of the day and made his bid for glory towards the top of the final climb, the Cote de Pramartino, and managed to stay upright on the fast 8km run in to the finish. Behind, Alberto Contador and Samuel Sanchez tried breaking clear on the descent, but were caught by the Schleck brothers and Cadel Evans within the final kilometre. However Voeckler, who nearly fell on the early part of the downhill, ran wide and was unable to rejoin the favourites. The maillot jaune, along with Ivan Basso, lost 27 seconds to their GC rivals. Boasson Hagen won stage six into Lisieux, and was outsprinted by Thor Hushovd twenty-four hours ago. pleased to take his second Tour stage as the race crossed the Italian border this afternoon. “I tried to get in the break again and the team did a great job to get me in it. “It took a long time to happen but finally we went away. I felt great the whole day and got some extra power because I wanted to win and also from the fans on course,” he added. Boasson Hagen was one of 14 riders who escaped early on in the 179km stage. Initially instigated by Sandy Casar (FDJ), Ruben Perez (Euskatel), Bauke Mollema, Maarten Tjallingii (Rabobank), Dmitriy Fofonov (Astana), Dmitriy Muravyev (RadioShack), Andrey Amador (Movistar), Maciej Paterski (Liquigas), Sylvain Chavanel (Quick Step), Julien El Fares (Cofidis), Borut Bozic, Bjorn Leukemans (Vacansoleil-DCM) and Jonathan Hivert (Saur-Sojasun) also made it across. Their lead was consistent, although never soared above nine minutes as Casar was in the top 25 overall at the start of the day. Behind, Mark Cavendish (HTC-Highroad) and his team-mates were happy to let the break go, particularly that left just one point for the peloton to compete for at the intermediate sprint at Villar-Saint-Pancrace, which Cavendish duly took. The green jersey leader made it up the second category climb of the Col de Montgenevre and the harder ascent up to Sestrieres, and was only shelled out in the final 20km. He made it to the finish safely, and barring a hiccup, should keep the points competition lead to Paris. Ahead, Perez jumped out of the leading group half-way up the climb of Sestrieres, and quickly amassed a 1-30 gap on the 13 chasers. It looked good for the Spaniard until he got to the final climb, the Pramartino, which began with 16km remaining. His lead had been whittled down to just 30 seconds, and a flurry of attacks from those behind meant he was soon within sight. 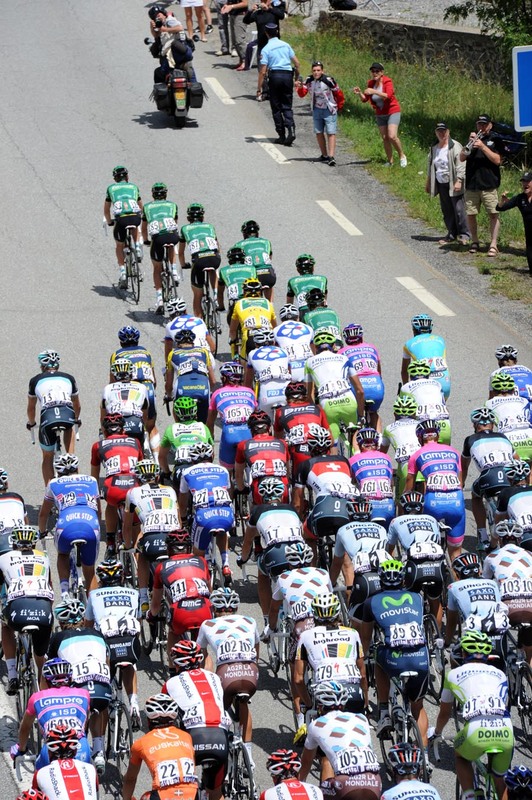 Once caught, Chavanel was the first to put in a big dig, before Boasson Hagen followed and soon passed the Frenchman. At the top of the climb, the Sky rider had a solid gap over his nearest chasers, who were now Hivert and Mollema. Hivert ran wide early on the descent, but his efforts to stay upright didn’t count for much as he fell just a handful of corners later. Rabobank’s Mollema ploughed on, but never looked like catching the lone leader. He eventually took second. After his time gains yesterday, Alberto Contador tested the Schleck brothers once again, attacking twice on the ascent. 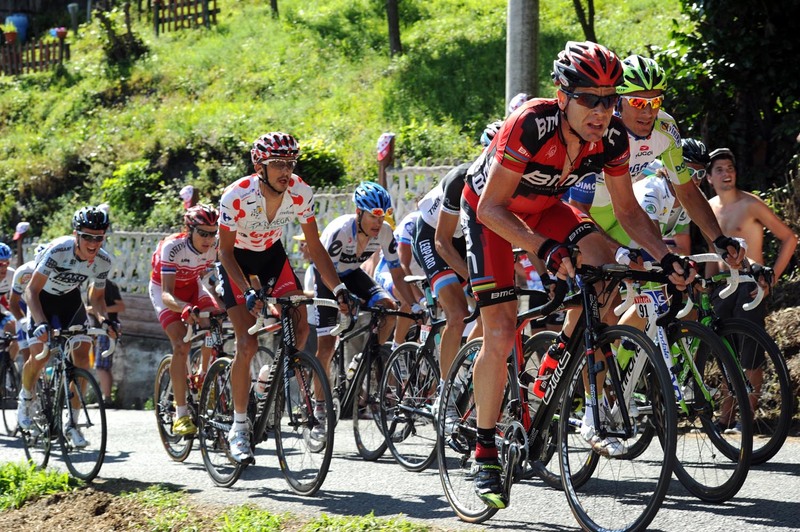 Both moves were followed, although only Samuel Sanchez could stay with him when the Spaniard broke clear on the descent. Voeckler ran wide on one corner and then overshot a left-hander, and was forced to head down someone’s driveway to stay upright. Hivert, just minutes before, also had to take this escape road to prevent falling off again. Boasson Hagen crossed the line, arms aloft and pointing to his sponsor’s logo, but the real interest was behind. The Schlecks and Evans were chasing down Contador and Sanchez, Basso was in another group behind and Voeckler after him. As the Spanish duo rounded the final bend onto the finishing straight, the Schleck group caught up with them – you could almost hear the relief from the brothers and the Australian. Voeckler once again ensured his losses were minimal, but any talk of him holding on to Paris must surely be over, considering what lies ahead before the race finishes on Sunday. 10. Borut Bozic (Slo) Vacansoleil-DCM all at st.
166. Mark Cavendish (GBr) HTC-Highroad all at st.
4. Andy Schleck (Lux) Leopard-Trek at 2-39.